The Best Ecommerce Marketing blogs from thousands of top Ecommerce blogs in our index using search and social metrics. Data will be refreshed once a week. Traverse City, Michigan, U.S. About Blog Independent analysis and strategy for online merchants — Amazon, SEO, analytics, marketing, design, payments, social media, cross-border, multichannel, shipping, much more. Facebook fans 8,831. Twitter followers 34,576. Facebook fans 49,295. Twitter followers 239,243. San Diego, CA About Blog CPC Strategy is a retail-focused Search agency that uses a proprietary Search optimization process to drive conversions by matching inventory with consumer intent. Read the CPC Strategy blog to get retail performance marketing strategies for paid search, Google Shopping, Amazon, Facebook, and general ecommerce marketing. Facebook fans 11,740. Twitter followers 2,558. About Blog A blog about ecommerce marketing, running an online business and updates to Shopify's ecommerce community. Facebook fans 3,074,989. Twitter followers 235,469. Toronto About Blog The top rated ecommerce blog providing in-depth insights, guides and tactical advice on how to build, launch and grow an ecommerce business. Facebook fans 5,944. Twitter followers 12,117. San Francisco, Austin & Sydney About Blog BigCommerce is a true all-in-one ecommerce platform with the power to grow your business & help you sell more. Facebook fans 264,444. Twitter followers 57,154. Bozeman, MT About Blog Everything you need to know to start and grow your eCommerce business. In-depth articles on choosing a product all the way to fulfillment and marketing. Facebook fans 3,535. Twitter followers 9,388. Austin, TX About Blog Volusion’s Blog is a helpful resource for entrepreneurs, small business owners and ecommerce marketers. Learn how to increase conversions & attract traffic. Facebook fans 56,242. Twitter followers 37,570. About Blog Whether you're a fast-growing e-tailer or a global e-commerce brand, Sleeknote is the best e-commerce blog for CRO, email marketing, list building and more. Facebook fans 3,849. Twitter followers 2,927. California About Blog Convert Experiences is the most affordable and fastest enterprise A/B testing and personalization solution for data-driven decision in high-traffic websites. Facebook fans 2,406. Twitter followers 5,026. Vancouver BC About Blog The Get Elastic ecommerce blog is the definitive online source providing the latest best practices, better ways to manage your digital relationship, and thought leadership on future-proofing your commerce platform. Facebook fans 5,089. Twitter followers 12,699. 12. Bootstrapping Ecommerce | Helping entrepreneurs bootstrap their ecommerce business. About Blog Bootstrapping Ecommerce is all about highlighting the different ways you can get started in ecommerce with the smallest of budgets while also learning how to be creative with the little time and money you do have, and how to think more critically about each decision you make. Facebook fans 34. Twitter followers 5,810. South Carolina, USA About Blog Convert better, rank higher & make more sales with Karon Thackston's conversion / copywriting / SEO / Ecommerce / Amazon / online marketing blog. Facebook fans 3,734. Twitter followers 2,180. 14. Pinnacle Cart's eCommerce Blog | Online Store Tips And More. Phoenix, Arizona About Blog Learn how to succeed in eCommerce marketing, running an online business and more from industry experts. Facebook fans 3,342. Twitter followers 2,216. About Blog Take your eCommerce Business to the next level with Store Growers actionable marketing articles. Facebook fans 183. Twitter followers 134. San Francisco About Blog A Blog About Analytics, Marketing and Testing. Facebook fans 40,533. Twitter followers 256,429. Boston About Blog WordStream Inc. provides software and services to help online marketers maximize the performance of their paid search and social campaigns, driving traffic, leads, and sales for lower costs. WordStream has been recognized for thought leadership in digital marketing through its blog and free learning resources including PPC University, and also offers award-winning free tools. Facebook fans 62,233. Twitter followers 286,946. Boston, MA About Blog Discover applicable ideas for how you can delight customers and build/measure true customer loyalty. Help Scout develops Help Desk software and customer support tools. Facebook fans 3,335. Twitter followers 10,142. Santa Barbara, CA About Blog The source for best practices in e-commerce, knowledge to increase sales, and FastSpring updates. Facebook fans 1,304. Twitter followers 2,653. 20. Magento Blog | eCommerce marketing trends, best practices and thought leadership. Los Angeles, CA About Blog The Official blog of Magento. Get the latest news, tips and advice for maximizing your online store from Magento's ecommerce blog. Start growing your online business today with Magento. Facebook fans 34,415. Twitter followers 76,127. Global About Blog A blog about running an e-commerce online business, marketing tips and Ecwid updates. Ecwid is basically a Democratizing E-Commerce for Small Business Globally. Facebook fans 101,593. Twitter followers 6,533. New York, USA About Blog The Yotpo blog covers eCommerce tips, marketing trends, and strategies to get the most out of reviews through social commerce and UGC marketing. Facebook fans 23,564. Twitter followers 16,588. Chicago, IL About Blog Email marketing blog discussing email marketing features, deliverability, new marketing ideas, and more. Facebook fans 13,533. Twitter followers 7,018. Raleigh, North Carolina About Blog ChannelAdvisor's e-commerce blog covers the latest on digital marketing and marketplace trends for hundreds of channels: Google, Facebook, Amazon, Walmart.com and more. Facebook fans 8,248. Twitter followers 10,791. About Blog In-depth growth & conversion optimization blog for advanced optimizers. At the head of ConversionXL is Peep Laja, a self-professed “conversion optimization junkie”. He is also the founder of Markitekt, a data-driven agency that helps ecommerce and SaaS companies grow. Facebook fans 7,558. Twitter followers 6,156. Atlanta, GA About Blog Springbot eCommerce marketing automation platform integrates the data, content, and multi-channel marketing tools. Marketing optimization made easy for Shopify & Magento! Facebook fans 1,408. Twitter followers 5,413. Facebook fans 3,793. Twitter followers 3,519. About Blog Omnisend is a powerful email marketing platform for ecommerce. We help you to convert the visitors of your online store and retain your customers. Facebook fans 2,216. Twitter followers 12. Boston, MA About Blog Salsify's Product Experience Management (PXM) platform enables brands to deliver the product experiences consumers demand. Facebook fans 280. Twitter followers 1,610. London, England About Blog A blog about ecommerce analytics, marketing, trends and more. Facebook fans 281. Twitter followers 2,715. About Blog Get content that converts to sales. Join 160,000 of your peers and learn more about advertising and online marketing! Facebook fans 38,266. Twitter followers n/a. Hungary About Blog A blog about ecommerce, conversion optimization and updates to OptiMonk's community. Facebook fans 11,474. Twitter followers 3,106. San Diego, CA About Blog Browse Miva’s Blog for expert ecommerce strategy, visual content and pro tips for omnichannel enterprise sales. Resources and best practices for online business. Facebook fans 8,759. Twitter followers 2,155. Canada About Blog Learn proven tips and tactics to help you increase sales and grow a profitable successful eCommerce online business. Facebook fans 9,475. Twitter followers 46. 35. BuildaBazaar Blog | Ecommerce Marketing Tips on How to Create Your Own Store at BuildaBazaar. Facebook fans 3,288. Twitter followers 1,216. Edmonton, Alberta About Blog E-Commerce Revenue Optimization Blog by Granify. Facebook fans 346. Twitter followers 1,354. Facebook fans 337. Twitter followers 1,612. Denver, Colorado About Blog Insights is a thought-leading eCommerce blog by Inflow focused on Inbound Marketing across SEO, paid, conversion, email and social channels. Facebook fans 1,417. Twitter followers 1,766. San Francisco, CA About Blog Welcome to the OnlineSales.ai's E-Commerce Marketing Blog. Get the Latest E-Commerce Marketing Updates on Artificial Intelligence, Social Media Marketing & Search Engine Marketing. Facebook fans 2,049. Twitter followers 1,191. Wakefield, Leeds & Manchester, UK About Blog Expert eCommerce advice and insights to help you to grow your online store faster. Facebook fans 165. Twitter followers 2,178. Brighton About Blog Read the ThoughtShift digital marketing blog for the latest eCommerce SEO, PPC and social media blogs and keep up-to-date with new industry trends. Facebook fans 181. Twitter followers 1,386. Ottawa, Ontario About Blog Rare is a predictive email marketing solution for online stores that helps you send personalized product recommendations to your customers at the time they’re most likely to buy. Facebook fans 609. Twitter followers 837. Seattle About Blog Lisa Suttora Ecommerce Marketing Blog for Independent Online Merchants. Leading-edge Amazon strategies to stay ahead of your competition! Facebook fans 1,718. Twitter followers 2,917. Cincinnati, Ohio About Blog Read the latest Magento news as well as eCommerce, Marketing and Technical news from InteractOne. Facebook fans 501. Twitter followers 663. Birmingham, England About Blog If your business isn’t into QR codes right now, you might often think to yourself: What’s the big deal with a bunch of upgraded barcodes? For starters, Quick Response codes provide customers with instant access to content and promotions. Facebook fans 15. Twitter followers 28. Akron OH / Chicago IL About Blog The go-to resource for taking your e-commerce business to the next level. Facebook fans 177. Twitter followers 142. Worlwide About Blog E-Commerce Nation is a community for E-Commerce business owners. Join today to get informed, grow your network, and exchange with like-minded professionals. Facebook fans 1,824. Twitter followers 14,313. United States About Blog We are ecommerce seo services provider. We provide ecommerce product listing services, ecommerce product optimization, online store management services and multi channel ecommerce support in all over world. Facebook fans 696. Twitter followers 88. London, England About Blog Our ecommerce marketing blog with tips on conversion optimization. Facebook fans 47. Twitter followers 44. About Blog Power your online storefront with our tailored Ecommerce SEO and PPC strategies. Helping your business reach new heights and set new sales records. Join us in weekly discussions on E-Commerce Marketing, Search Engine Optimization, growth hacking and business development tips that will make you sales. New Zealand About Blog Find out how to optimise & improve your eCommerce marketing with the latest strategies, techniques, tools & articles. Facebook fans 254. Twitter followers 399. Indianapolis, IN About Blog Get usefull, actionable strategies and tactics to boost your ecommerce marketing efforts. Extensive guides, case studies and examples of real world online marketing solutions to enhance your online store. Facebook fans 200. Twitter followers 3,677. About Blog Our Magento ecommerce and digital marketing blog provides analysis and tips to help you plan, prepare and build converting websites. Facebook fans 3,534. Twitter followers n/a. 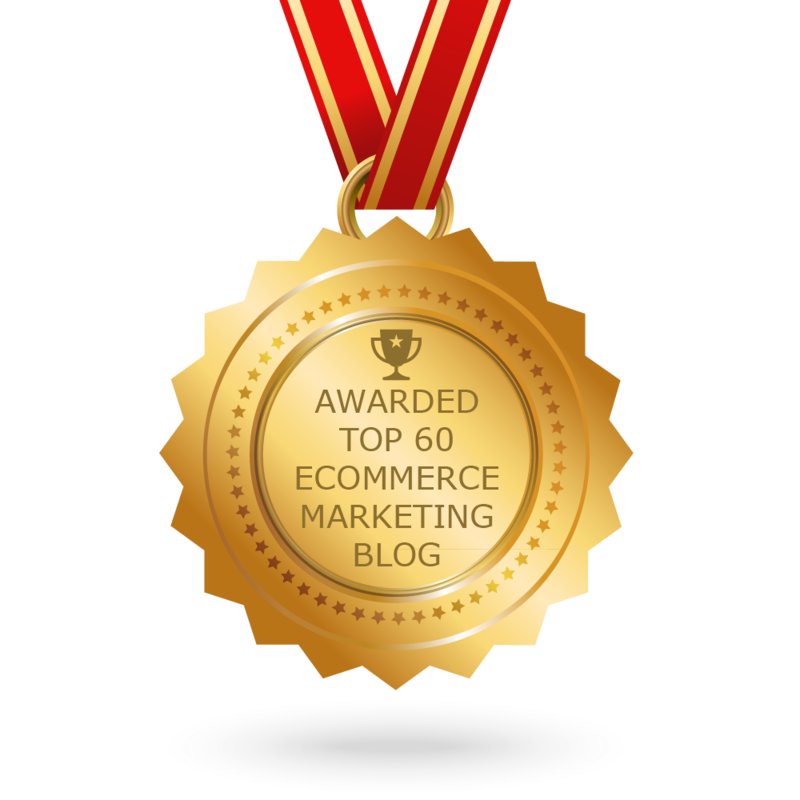 CONGRATULATIONS to every blogger that has made this Top Ecommerce Marketing Blogs list! This is the most comprehensive list of best Ecommerce Marketing blogs on the internet and I’m honoured to have you as part of this! I personally give you a high-five and want to thank you for your contribution to this world.